The wait is over! 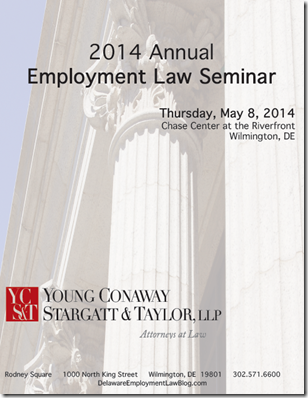 Registration is now open for YCST’s Annual Employment Law Seminar. This year’s seminar will be held on May 8, 2014, at the Chase Center on the Riverfront in Wilmington. Check out the registration brochure for specific topics, speakers, and schedule. We hope to see you there!